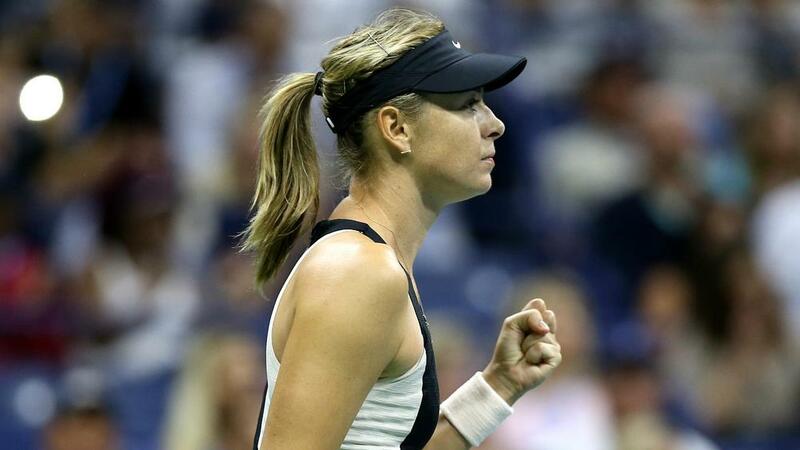 Maria Sharapova extended her remarkable winning streak in night matches at Arthur Ashe Stadium, beating Jelena Ostapenko on a day when the women's singles draw opened up even further. Sharapova has now won 22 matches in row under the lights of Ashe, having triumphed 6-3 6-2 against a totally out-of-sorts Ostapenko, who racked up 40 errors and 27 in the first set alone. Ostapenko was one of several seeds to bow out on Saturday and New York is certain to crown the fourth different women's slam champion of the year after Wimbledon winner Angelique Kerber joined Simona Halep and Caroline Wozniacki in being eliminated on Louis Armstrong. Fifth seed Petra Kvitova, sixth seed Caroline Garcia and Kiki Bertens (13) also fell by the wayside, while Naomi Osaka produced the standout performance of the day - double-bagelling Aliaksandra Sasnovich. After getting the better of Ostapenko to set up a meeting with Garcia's conqueror, Carla Suarez Navarro, Sharapova reflected on her love affair with night matches on Ashe. "There's no doubt that I feed off of this energy. It's really inspiring to play on this court in front of this crowd," said the Russian in her on-court interview. "Every time I walk through that tunnel it still feels like it's my first time here." Suarez Navarro, the 30th seed, beat Garcia 5-7 6-4 7-6 (7-4). Halep, Wozniacki and Garbine Muguruza had all seen their campaigns end on Louis Armstrong and it was the same story for Kerber as the German lost 3-6 6-3 6-3 to Dominika Cibulkova. "I had my chances, but I couldn't take them, especially in the third set." explained the vanquished fourth seed. A delighted Cibulkova said: "It feels pretty good and special. This year I lost to Angelique twice and, even during those matches, I was playing pretty solid. She just didn't give me any chance. "So now we had to change something ... and I was able to do it and it was working 100 per cent." Cibulkova faces another stiff test in the last 16 against last year's beaten finalist Madison Keys, a 4-6 6-1 6-2 victor over Aleksandra Krunic. There is no hotter player in the draw than Osaka, who spent just 50 minutes on court for the second match running as she thumped Sasnovich 6-0 6-0. Amusingly, Osaka was 0-40 down in the opening game! Osaka will face Aryna Sabalenka, who stunned two-time major winner Kvitova 7-5 6-1 in round four. The other last-16 tie will see Marketa Vondrousova, the youngest player left in the draw and the conqueror of Bertens on Saturday, face Lesia Tsurenko, who followed up her shock win over Wozniacki with a straight-sets success against Katerina Siniakova.